Now that it’s the time of year when we’re not involved in so much hands-on stuff with our colonies, it’s a good time to consider taking a course, attending a workshop or a bigger event, in order to gain more knowledge and insight. b) Another event is a talk by Jennifer Berry, leading American bee breeder, researcher, author and lecturer. 7.30pm Thursday 5th November, Crofton Hall, Orpington. Sidcup beekeepers would like to remind everyone that Jennifer Berry, a world renowned expert and colleague of Keith Delapane at Georgia University, is giving a talk : ‘an American take on beekeeping’, on 5 November. For the past fourteen years, Jennifer has been the Apicultural Research Coordinator and Lab Manager for the University of Georgia Honey Bee Programme. Recently, she has also undertaken an ambitious campaign to educate the public about the importance of pollinators and other beneficial insects, including honey bees, and how to reduce pesticide use.This should be a fascinating evening – Jennifer has published many articles and academic papers, and some of her queens reside in colonies at the White House. We are very privileged that she has agreed to fit in this event for us whilst visiting the Northern Ireland annual conference – there will not be another opportunity this year to hear her lecture in SE England. c) The National Honey Show (http://honeyshow.co.uk/) is on at the end of October, in Surrey. This is a major national event and a fascinating one, with so many good talks and workshops, exhibitions and seminars, as well as the mindboggling variety of items in the trade hall. It’s a very good day/weekend to consider attending whether you’re a complete beginner, an improver, or someone who is thinking about becoming a beekeeper. 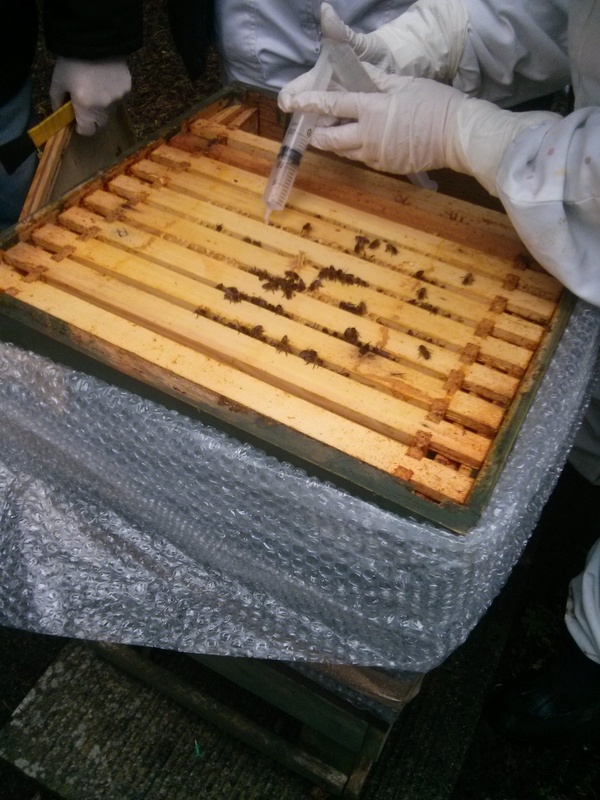 This entry was posted in How to, News - local, Training & events and tagged advice, events, Learning on 22/10/2015 by whbbeekeepers. 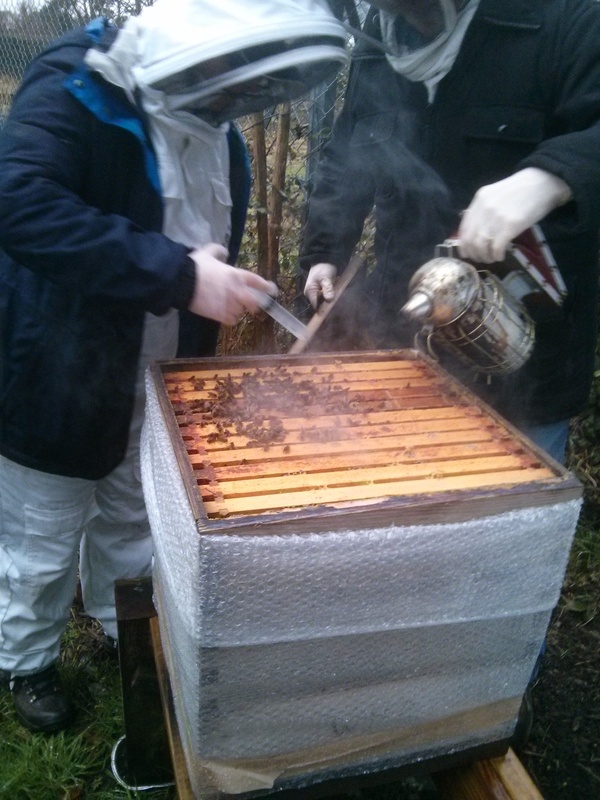 This entry was posted in How to, Training & events and tagged winter on 21/09/2015 by whbbeekeepers. Inspections of the branch hives went smoothly, with some newcomers getting their first experience of how a hive full of honeybees looks inside. Julie’s demonstration of honey extraction and how to make ‘creamed honey’ was well received, with many members interested in the process. Looking forward to the autumn, there will be not only our own honey show to prepare for but also the giant National Honey Show (http://www.honeyshow.co.uk/). Julie will be circulating some more information and tips about this in her next Newsletter, so look out for that soon. There is also the Kent Festival of Bees, at the end of this month, at which our branch will have a stall. This entry was posted in Monthly meeting, News - local, Training & events on 02/08/2015 by whbbeekeepers. The branch meeting on 3rd January started in somewhat inclement weather. As we huddled in the meeting hut, our branch Secretary, Julie, gave a short presentation explaining the purpose of this seasonal Oxalic Acid treatment, as well as reminding those present about the importance of keeping good hive records throughout each year as an aid to assessing each colony’s character and performance. As the weather cleared to merely damp, we then went to the bees. The four branch hives had their roofs and crown boards removed, 5ml of Oxalic Acid was syringed down the space between each top bar where there were bees present; this varied between 5 and 8 applications per colony. The crown boards and roofs were then replaced quickly to avoid chilling, and we returned to the hut for tea and debrief. This entry was posted in How to, Monthly meeting, Training & events and tagged advice, anti-varroa, winter on 03/01/2015 by whbbeekeepers. Following on from the National Honey Show, last month, four of the lectures recorded over the event have so far gone up on The Honey Show’s YouTube channel and are well worth watching. See https://www.youtube.com/channel/UCiOtIebcpY0Zqqma0H5wLYQ It is intended that all of this year’s lectures will be up there soon. Our Whitstable & Herne Bay Beekeepers’ branch has a stall at Macknade Fine Foods’ late opening (till 8 pm) this coming Thursday, 18th December. Why not come along and say hello to Keith and Tilly who will be running our stall, support the branch, and stock up on a few of Macknade’s comestibles at the same time? BeeCraft will be holding another of their Google Hangouts (online webinars) this Wednesday, 17th December, starting at 8 pm. It’s not difficult to take part (or just to watch/listen) and the whole thing is explained here: http://www.bee-craft.com/beekeeping/hangouts/ Tomorrow’s session is all about ‘products of the hive other than honey’. If you’d like to send in a question ahead of the event, the link above has details of how to do so. Propolis as a cure for baldness – http://www.the-scientist.com/?articles.view/articleNo/41647/title/Honeybee-Compound-for-Hair-Loss-/ ? Well, it’s useful for lots of other things, so why not this as well. Thorne’s Winter Sale will start on the 3rd of January in 2015. Keep an eye on this page of their website for more details over the next couple of weeks – http://www.thorne.co.uk/winter-sale . This is always a very popular event and things go fairly fast. This entry was posted in News - international, News - local, News - national, The Bee Brief, Training & events on 16/12/2014 by whbbeekeepers. b) Advance warning that there will be a BIBBA workshop on Saturday, 21 February 2015. Details below, circulated by the workshop hosts, the Dover & District Beekeepers’ Association. for the more advanced beekeeper, or those working in groups. Time:- 9.00 for 9.30-4.30 approx. Venue:- Elham Village Hall, Canterbury Road, Elham, Kent. CT4 6SX. adult. Refreshments and lunch included. Bookings taken from 1st November 2014.
c) If anyone would like to order boxes of honey jars for next year, please let Roger or Julie know asap (their contact details are in the email circulated yesterday by Julie) . Roger will be putting in a bulk order shortly. He can purchase jars at 30p each for a box of 72 jars but we need to buy a pallet of boxes to get this very low price, hence the need to let him know urgently if you want to take part in the order. 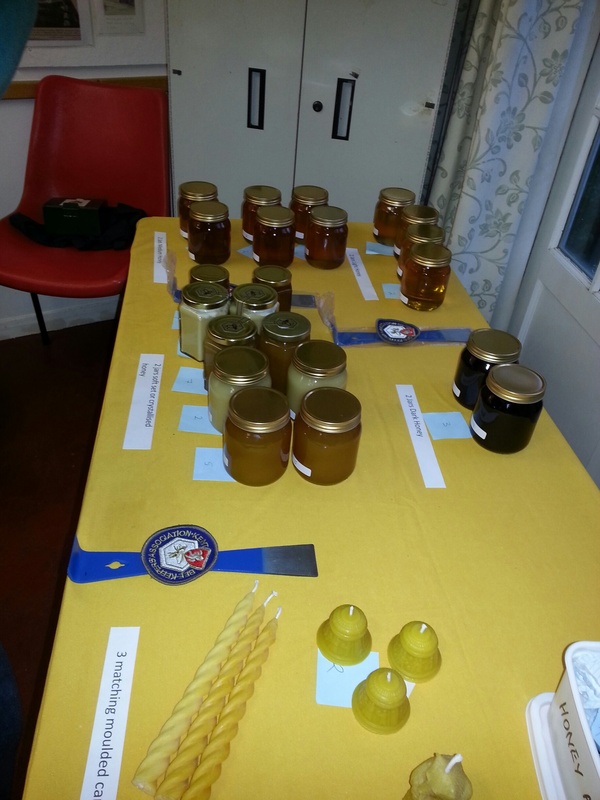 This entry was posted in Beekeeping Alert, News - local, Training & events on 06/10/2014 by whbbeekeepers.